Esco VIVA® Universal Workstation draws on Esco's experience of over 35 years in laminar air flow technology. The enclosure employs two independently balanced ULPA filtration modules and an airflow recirculating design similar to a Class II Type A2 biosafety cabinet. This delivers safety benefits for your animals and operators. In addition, the VIVA® Universal Workstation represents a complete solution to your need for operator comfort. These include designs for enhanced ergonomics and protection from odors common in animal handling operations. Protect animals inside the enclosure from exposure to airborne particulates/ambient contamination. Protect the operator from exposure to allergens and other potentially hazardous materials. Operator comfort ensured via an ergonomic design and integrated filters to remove odors. Precise airflow engineering, ULPA filtration and ISOCIDE™ antimicrobial powder coating offer unique protection. Latest generation DC ECM blower provides stable airflow with low energy consumption. 99.9% ELISA-verified allergen containment for operator and environment protection. Biosafety cabinet class II containment and ISO Class 3 work zone. Ergonomic design, with ADA-compliant controller and optional motorized height-adjustable stand. 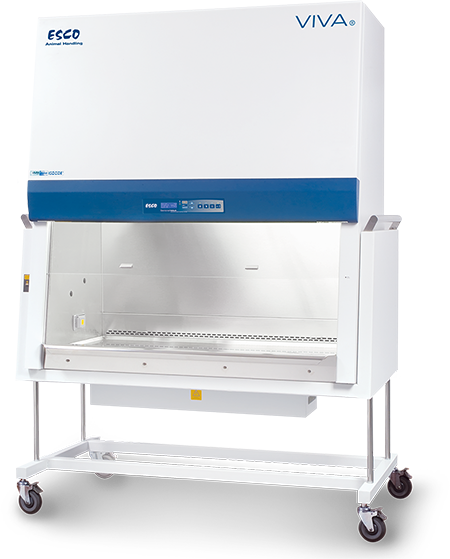 Controlled inflow, down-flow and exhaust similar to Class II Type A2 biosafety cabinet technology. ISO Class 3 air cleanliness within work zone. This is equivalent to Class 1 per the US Federal Standard 209E, which is 100X cleaner than Class 100 classification on standard cabinets offered by other providers. ULPA filter technology which operates at the typical efficiency of 99.999% at MPPS, 0.3 and 0.12 microns provides better operator, product and environmental protection than conventional HEPA filters. Fail-safe system shuts cabinet down automatically in case of airflow failure to ensure operator and environmental safety. Esco ISOCIDE™ powder coating prevents surface bacterial growth and enhances operator safety. Ergonomically sloped front design for operator comfort. Integrated carbon filters remove odors emitted. Proprietary airflow sensing technology alerts the operator to unsafe sash position and low airflow via audible and visual alarms. Esco Sentinel™ Microprocessor allows the operator easy access and control of all cabinet functions on the LCD screen. Optional height stand adjustment for operator comfort. Esco offers a variety of options and accessories to meet local applications. Contact Esco or your local Sales Representative for ordering information on these and other accessories. Elevates to accommodate user preference for sitting or standing work surface height with a touch of a button. When lowered permits movement through standard doorway. Utilizes electro-hydraulic motor to adjust the height. Controlled by automatic UV lamp timer through Sentinel microprocessor control panel. Lamp is positioned away from operator line-of-sight for safety and proper exposure to interior surfaces. Chemically treated, improves operator comfort, easy-to-clean. 711 mm (28") standard size.